Pays for itself in less than 1 year. The average family of four, taking 10 minute showers, consumes 128 gallons of water a day with a standard showerhead. If that same family used an Oxygenics® SkinCare Shower, they would only use 58 gallons of water. 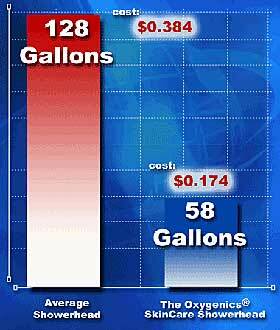 Assuming a water cost of $0.003 per gallon, the average family of four would save $0.21 a day, or almost $75 per year!